Translucent Arkansas bench stone 3” x 1” x 1/2”. Traslucent Arkansas (Extra Fine) Stones are classifications included in the True Hard Arkansas grade category according to specific gravity density standards. True Hard terminology was adopted to include all extra fine stones regardless of color. Translucent stones may be translucent shade of gray, white, yellow, brown or sometimes even pink. They are most commonly used for industrial applications where and extremely fine polish is required. 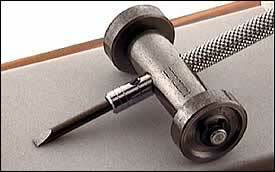 At only one inch wide the stone cannot be used with the Bergeon screwdriver holder for shapening screwdrivers. Comes mounted in wood box. 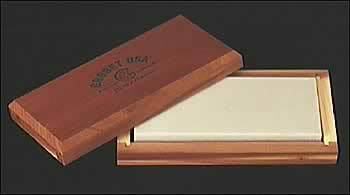 Translucent Arkansas Stone in Wood Box 4" x 2" x 1/2"
Measurements are 4" x 2" x 1/2". Traslucent Arkansas (Extra Fine) Stones are classifications included in the True Hard Arkansas grade category according to specific gravity density standards. True Hard terminology was adopted to include all extra fine stones regardless of color. Translucent stones may be translucent shade of gray, white, yellow, brown or sometimes even pink. They are most commonly used for industrial applications where and extremely fine polish is required. Translucent Arkansas Stone in Wood Box 6" x 2" x 1/2"
Measurements are 6" x 2" x 1/2". 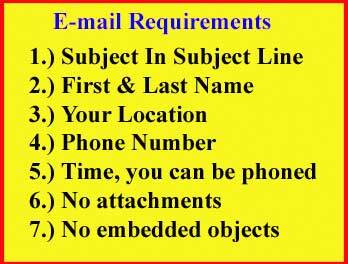 Traslucent Arkansas (Extra Fine) Stones are classifications included in the True Hard Arkansas grade category according to specific gravity density standards. True Hard terminology was adopted to include all extra fine stones regardless of color. Translucent stones may be translucent shade of gray, white, yellow, brown or sometimes even pink. They are most commonly used for industrial applications where and extremely fine polish is required. Hard Arkansas Stone in Wood Box 4" x 2" x 1/2"
Measurements are 4" x 2" x 1/2". 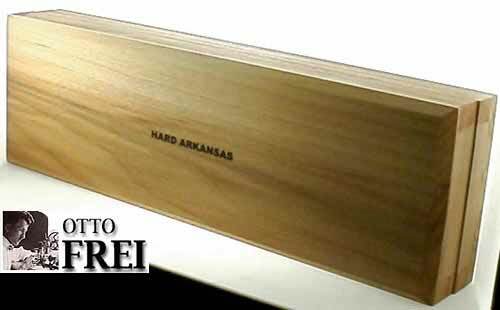 Hard Select Arkansas (Fine) is most suitable for fine polishing and the maintenance of a fine edge on knives or tools. Hard Select Arkansas is often referred to as "White Hard". However, users should be aware that Hard Select Arkansas often has color variations also. To our knowledge, this color does not interfere with the honing process by any means. Hard Select Arkansas stones are popular among woodcrafters and a variety of industries including the dental industry. Measurements are 6” x 2” x 1/2”. 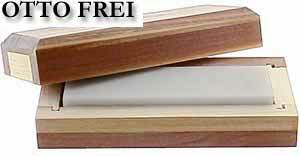 Hard Select Arkansas (Fine) is most suitable for fine polishing and the maintenance of a fine edge on knives or tools. Hard Select Arkansas is often referred to as "White Hard". However, users should be aware that Hard Select Arkansas often has color variations also. To our knowledge, this color does not interfere with the honing process by any means. Hard Select Arkansas stones are popular among woodcrafters and a variety of industries including the dental industry. Measurements are 10" x 2 1/2" x 1". Hard Select Arkansas (Fine) is most suitable for fine polishing and the maintenance of a fine edge on knives or tools. Hard Select Arkansas is often referred to as "White Hard". However, users should be aware that Hard Select Arkansas often has color variations also. To our knowledge, this color does not interfere with the honing process by any means. Hard Select Arkansas stones are popular among woodcrafters and a variety of industries including the dental industry. 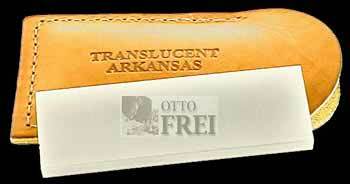 Translucent Arkansas Stone in Leather Pouch 3 x 1 x1/4"
Measurements are 3"x 1" x 1/4". Traslucent Arkansas (Extra Fine) Stones are classifications included in the True Hard Arkansas grade category according to specific gravity density standards. True Hard terminology was adopted to include all extra fine stones regardless of color. Translucent stones may be translucent shade of gray, white, yellow, brown or sometimes even pink. They are most commonly used for industrial applications where and extremely fine polish is required. Translucent Arkansas Stone in Plastic Case 4" x 1" x 1/4"
Measurements are 4" x 1" x 1/4". Traslucent Arkansas (Extra Fine) Stones are classifications included in the True Hard Arkansas grade category according to specific gravity density standards. True Hard terminology was adopted to include all extra fine stones regardless of color. Translucent stones may be translucent shade of gray, white, yellow, brown or sometimes even pink. They are most commonly used for industrial applications where and extremely fine polish is required. Great for polishing pivots, pinions and much more. Five differnt shapes are available: Flat 3 mm, Flat 4 mm, 1/2 Round shape, Crossing and this Round Pointed. The useful length of the sapphire burnishing end is 25 mm long. Great for polishing pivots, pinions and much more. Five differnt shapes are available: Flat 3 mm, Flat 4 mm, Round Pointed, Crossing and this 1/2 Round shape. The useful length of the sapphire burnishing end is 25 mm long. Great for polishing pivots, pinions and much more. Five differnt shapes are available: Flat 4 mm, 1/2 Round shape, Round Pointed, Crossing and this Flat 3 mm. The useful length of the sapphire burnishing end is 25 mm long. Size: 15 x 15 x 150 mm. Sharpen and refinish your screwdriver baldes with this 15 x 15 x 150 mm, medium grain India stone, mounted of a wood base. Bergeon screwdriver holder keep the blade at the correct angle while you roll it back and forth on your shapening stone.